The name Maqbool Fida Husain has become almost synonymous with contemporary Indian art, and deservedly so, for no single artist has popularised Indian art, within the country or internationally, as Husain has done. His endless quest for his cultural roots and a fearlessly open-minded willingness to absorb diverse influences has made M.F. 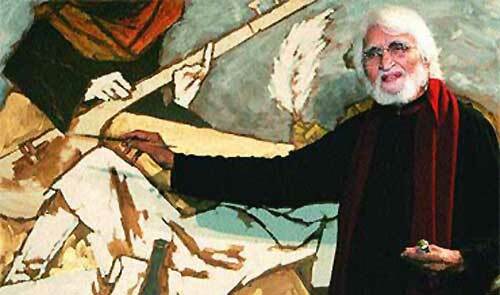 Husain one of the most recognizable figures of contemporary Indian art. Husain began his career by painting billboards for feature films and making furniture designs and toys, to earn a living. When he did take up painting as an art form, however, he returned time and again to his roots, and to themes that blended folk, tribal and mythological art to create vibrantly contemporary, living art forms. His rise as a public figure has as much to do with his style and presentation, as it does with his themes. He depicts the icons of Indian culture, through the ages, seeking to capture the quintessence of his subjects, like Mother Teresa and the characters of epics like the Mahabharata. Husain was born in 1913 in Pandharpur, Maharashtra. A self-taught artist, he came to Mumbai in 1937, determined to become a painter. In 1948, he was invited by F.N. Souza to join the Progressive Artist’s Group, a group formed to explore a new idiom for Indian art. Besides painting, he has also made feature films, such as “Through the Eyes of a Painter”, in 1967, which was a Golden Bear Award winner at the Berlin Film Festival, and “Gajagamini” in 2000. The Government of India honoured him with the Padma Bhushan and the Padma Vibhushan awards, both prestigious civilian awards. Husain passed away in London in 2011. Husain championed the artistic value of Serigraphy, a printing technique pioneered in England in the early 20th century. A serigraph is created using a stencil to print directly on paper. Porous fabric is stretched over a metallic or wooden frame to make a stencil. Then, paper or fabric is used to block off the negatives of the image. The stenciled screen is then placed over the printed medium while oil or water based ink is spread evenly across the screen. Finally, a rubber squeegee is used to press the ink through the porous fabric and onto the paper below. Jaypore is ecstatic to showcase a collection of limited edition signed serigraphs from Husain’s famous series such as Kerala, Horse, Ramayan, Mother Teresa, Ganesha and Krishna, treasures for an art collector and connoisseur. Posted in Art, Artist, Profiles and tagged art, Artist, contemporary, folk, ganesha, kerala, Krishna, MF Husain, mother teresa, Mythology, painter, Profile, serigraph, tribal. Bookmark the permalink. Hope you will showcase serigraphs of other Indian painters too.